In a pivot away from the “voice of the crowd” philosophy central to Digg’s early culture, the social news site has launched a human curated feature called “Breaking News” which spotlights top stories selected by Digg staff. 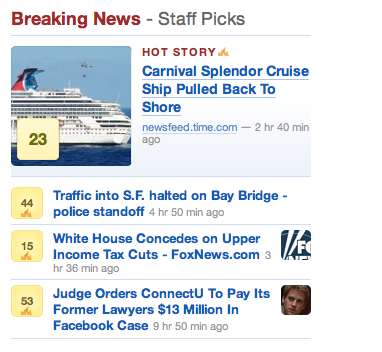 As of today you can find Breaking News in red widgets labeled “Breaking News” to the right of the Upcoming, My News, and Top News sections on the new Digg. Breaking News stories are also designated by flame icons. It’s commonly acknowledged that aggregators like Reddit, Hacker News and even Digg have had at least some administrative supervision (like TOS enforcements). Digg itself faced accusations of manually intervening on behalf of certain publishers in early October. Desai says this is the first time any Digg staff will put a concerted effort into picking stories for editorial reasons. Not all attempts at human curated news have been successful however. Breaking News resembles what Jason Calacanis attempted with Digg clone Propeller, which ultimately failed despite its novel editorial oversight features in part because it confused people accustomed to the classic Netscape.com. While human editing does make a news engine more competitive with Twitter and younger upstarts like BuzzFeed and Spotery, it is not a panacea and comes with its own set of headaches. Says Sorcini, “The only concern I would have is, It’d be nice to have some sort of transparency on their selection process, so users know there’s no slant (for example, favoring a advertising partner, such as BP).” And so it begins.